...is always good when it involves chocolate! That's right! These cute little Big Shot Matchboxes are perfect for a little something! The boys each gave their teachers one of these adorable boxes for Teacher Appreciation Day. It's no secret, I love my Big Shot die cutting machine! As soon as I saw the Matchbox die in the Occasions Mini catalog, I knew I had to have it. I see shower favors, party favors, teacher thank you's, valentine's for the classroom...the list is endless. The die makes mass producing these boxes a snap! Change the paper and change the theme. It's that simple! Here, I used the Baja Breeze DSP to wrap the Hershey's Nuggets. Wrapping the chocolates is the added heartfelt touch that the recipient will certainly notice and appreciate. The base is Baja Breeze card stock. These are so quick to crank out and fold into the box base. 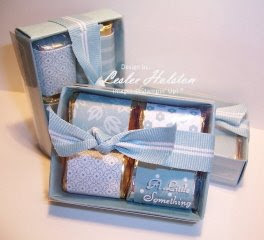 The sleeve uses the Medium Window Sheets (7 mil), also found in the Occasions Mini catalog. I had to 'play' with this a bit to get the perfect 'sandwich' combination for the die. Simply using the cutting pad, die and Premium crease pad wasn't thick enough to give the heavier acetate (window sheets) a good score line to fold on. I ended up having to shim the 'sandwich' by using a couple of sheets of thin cardboard. Once I found the right combo, to crank and make the sleeves was no problem at all. The die also includes 3 labels and Stampin' Up! offers a coordinating Matchbox Messages set to go with the labels. You can order yours today by visiting my SU! website here. Quick tip: If you are going to stamp on the sleeve, do the stamping before you form them up. In this case, I stamped my sentiment "A Little Something" in White StazOn. StazOn is the perfect ink for use on the acetate. You don't have to be 'crafty' to make these adorable boxes. Crank it out, form it up, add a simple ribbon and some chocolate and you have a lovely gift that would make anyone's day. Thanks for stopping by. I hope you've been inspired to make someone's day special!